This ongoing series of posts considers the historical reliability of the New Testament books of Luke and Acts by examining the relationship between the texts and other ancient sources. Primarily intended to assist those with a teaching ministry, it will cover both well documented and obscure correlations and will include periodic summaries and source references as relevant. The second individual in the list, Pontius Pilate, is a well known figure who is referenced in a number of ancient sources (e.g. Tacitus, Josephus). 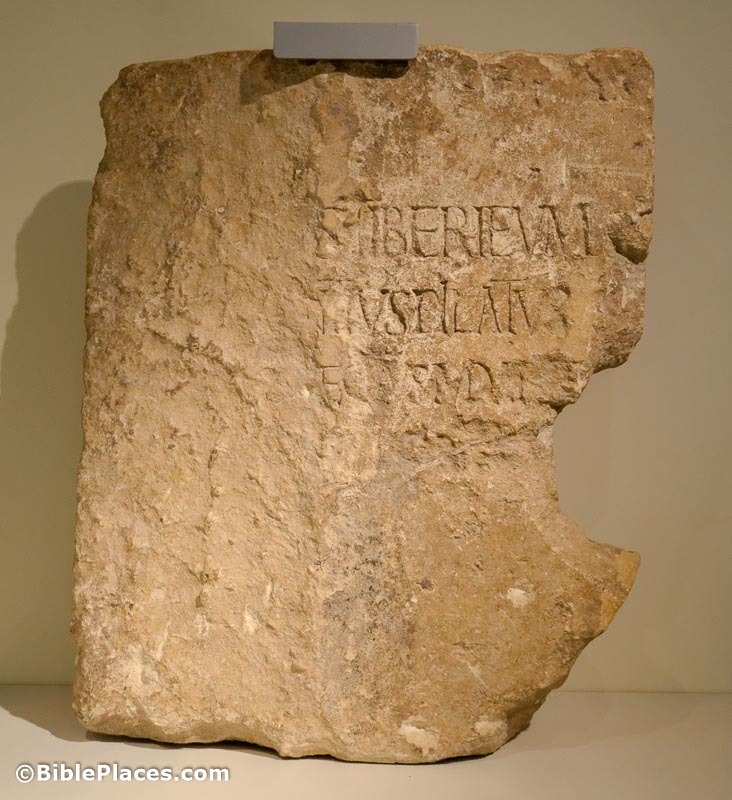 These sources include the inscribed limestone slab shown here that was found in Caesarea Maritima, Israel in 1961. It was originally made in c. AD 30. 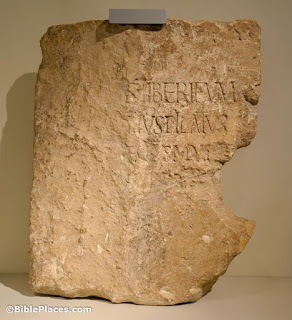 It is written in Latin and reads, "Tiberium Pontius Pilate Prefect of Judea." Scott Stripling provides an account of the 21st and final season of excavations at Khirbet el-Maqatir, possible location of biblical Ai. They found a Bronze Age stele in the final week of excavations. Breaking Israel News provides an illustrated report of Noam Arnon’s exploration of the caves below Hebron’s Machpelah 35 years ago. A medieval building constructed atop the Byzantine-era synagogue at Huqoq may also have served as a synagogue. Carl Rasmussen links to some new excavations in the Church of the Nativity in Bethlehem. Shem Tov Sasson brings his readers along on the annual two-day Bar Ilan University’s Archaeology tour, this year to the Aravah (part 1, part 2). A large display of Greek ceramics is now on display at the Bible Lands Museum in Jerusalem. The Louvre is planning to display some of its antiquities in Iran this spring. Iraqi authorities discovered more than 100 Assyrian artifacts in the home of an ISIS leader. “Critical Perspectives on the Practice of Digital Archaeology” is the title of a conference being held on Friday and Saturday at Harvard. If Israel was compared to the playing board of Monopoly, Wayne Stiles identifies “Boardwalk” as Tel Megiddo. I recently returned from a great study tour led by Dr. Mark Wilson. If you’re looking for an outstanding opportunity to learn the biblical lands outside of Israel, he’s leading a May walking tour in Turkey and a September-October tour of Malta and Italy. The latest episodes at The Book and the Spade include The Library at Herculaneum, with Brent Seales; Jesus and the Remains of His Day, with Craig Evans; and the Top 10 Biblical Archaeology Stories of 2016, with Clyde Billington. Leen Ritmeyer notes a special offer by Carta Jerusalem that includes a discount as well as a free copy of a new biblical archaeology map of Jerusalem. I plan to post more on that map shortly. We’re now on Instagram, posting a photo every day. We continue to do the same on Facebook and Twitter. Now on display in Australia is the British Museum’s famed bronze Head of Augustus from Meroë. The Museum of Troy is scheduled to open later this year. Though relations have recently been repaired between Turkey and Israel, there’s no movement towards returning the Siloam Inscription, Gezer Calendar, and Temple Balustrade Inscription to Jerusalem. Silver objects from the Roman Empire, including the Berthouville Treasure, are on display at the Museum of Fine Arts in Houston. The Eastman Museum is continuing its efforts to bring online its vast photographic collection. For example, a search for “Jerusalem” returns 24 pages with early photos by T.H. McAllister, Charles Chusseau-Flaviens, and the American Colony. If you missed the Metropolitan Museum of Art’s exhibit, “Jerusalem 1000-1400: Every People Under Heaven,” you can see many photos here. Once again in control of Palmyra, ISIS has destroyed the ancient theater and tetrapylon. The Associated Press examines the destruction of Nimrud caused by ISIS. Agatha Christie would be very unhappy. The Crusader castle known as Crac des Chevaliers has been damaged in the Syrian war, but the extent of destruction is currently unknown. Armed Libyan citizens have mounted patrols to protect Leptis Magna, an ancient city of Rome. A majority of the artifacts coming out of Syria are modern fakes. De Gruyter has made a number of its works published in 2016 open access. Giovanni Garbini and Joseph Fitzmyer both passed away in the last month. Gordon Govier lists his top 10 discoveries in biblical archaeology in 2016. The Biblical Archaeology Society has selected its top 10 biblical archaeology discoveries of the year. LandMinds has a one-hour video podcast discussing the list. Haaretz provides a list of the best archaeological finds in Israel in 2016. Live Science suggests the 9 biggest archaeology findings of 2016. And they identify 5 big archaeology stories to watch for in 2017. Brandon Marlon writes about 18 interesting sites that most tourists to Israel miss. ASOR is offering a free e-book of the “5 Most Popular Biblical Archaeology Articles from The Ancient Near East Today” to subscribers to the weekly newsletter. A marble sculpture of a Roman noblewoman was discovered by a farmer in Crete following a recent storm. Twelve tombs from the 18th Dynasty have been discovered in Gebel el Silsila. A study of a toy Roman chariot reveals that ancient charioteers affixed an iron strip to the right wheel in order to improve their chances of winning. As tourism in Egypt continues its lull, officials are trying new ways to attract visitors. There is only one archaeobotanist in Egypt, but he is hoping this will change. Ongoing work at Laodicea has uncovered the sacred agora. This May: Archaeology and History of Lydia: From the Early Lydian Period to the Late Antiquity (8th century B.C.-6th Century A.D.): An International Symposium. Robert Alter will be lecturing in Nashville on January 30. The Anglo-Israel Archaeological Society has a lecture series scheduled for the coming months. Archaeologists have discovered the Roman theater at the site of Hippos. Excavations of the Crusader-era Montfort Castle in Galilee have discovered game pieces, belt buckles, pig bones, and much more. Analysis of organic remains from a 10th B.C. gatehouse complex in the Timna Valley suggests that food and supplies were brought in from a long distance. Engravings of an ancient menorah and cross were found inside a cave in the Judean Shephelah. A gang of antiquities thieves was caught illegally digging at a site near the Golani Junction in the Galilee. A 3-minute video (in Hebrew) is online. What are the origins of tomb raider curses? Three scientists from Beersheba's Ben Gurion University have used NASA data to date the “sun standing still” to an eclipse in 1207 BC. A life-size CAVEkiosk (“cave automated virtual environment”) recently opened at UCSD will allow scholars to study 3-D data from at-risk sites. The Israel Museum has announced that Eran Neuman will succeed James S. Snyder as director. Wayne Stiles explains why God made the Israelites rest the land every seven years and what that means today. Colin Hemer’s The Book of Acts in the Setting of Hellenistic History is available in Logos this month for $1.99. I didn’t want this one to get lost in the weekend roundup, so here’s a link to the newly released, all-free video series entitled “Following the Messiah,” produced by Appian Way and featuring Barry Britnell. We have mentioned this several times in the past, including when they were raising funds for the project on Kickstarter. The work is now complete, and all five videos are posted on their website. You won’t have to watch very long to see that the production quality is first-rate. Each episode is 20-25 minutes in length. You can’t beat a personal visit to Israel, but for those who aren’t able to go, or for those eager to return, this is a terrific resource. A big thanks to Appian Way and to all of their supporters who made it possible!